My friend Jennifer has a tumblog, Mission Walks, where she chronicles the stuff she sees when she walks her dog (Poe) through the Mission. One thing I love about her blog is the spontaneity. It’s not that she sees the most interesting things you’ll find in the city. Instead each small item captures the weird and random detritus of a bustling metropolitan ecosystem. Maybe you didn’t know, but I too have a Bay Area tumblr blog wherein I strive to take a photograph of everything I see that makes me excited to live in the San Francisco Bay area. Sometimes I feel like the photographs I take on my own tumblog can’t capture how amazing NorCal is because each photo of each item is isolated. The odd things I find could be miles and weeks apart. But they’re not. Today on my walk to the post office and I decided to document all the little things. Many of these things aren’t spectacular on their own, but together these tiny things fill my world with joy on a daily basis. For example, I was pleased by how thick and strong this vine was (just South of the post office near 51st and Shattuck). It was so thick I imagined a skinny girl could climb right up the wall. Is this worth photographing? Probably not, but seeing this lush vine made me one point happier. The vine was enough, but I was equally amused that this tightly entrenched plant, which basically covered the majority of the building, was not on the hallowed brick halls of a fraternity house, but on the side of a parking garage. A FREAKING PARKING GARAGE. I can tell you, in Florida they don’t grow vines on the side of parking garages. I don’t know why. But California is relentlessly verdant. The Berkeley Wal-Greens actually has a green wall, because it too is covered in vines. Passion flowers, their odd stamen waggling like the antennae on an alien specie, frequently grow on the wire fences of parking lots. Few people keep lawns; you’re more likely to see an abandoned garden that’s continued to thrive and is slowly taking over the property. 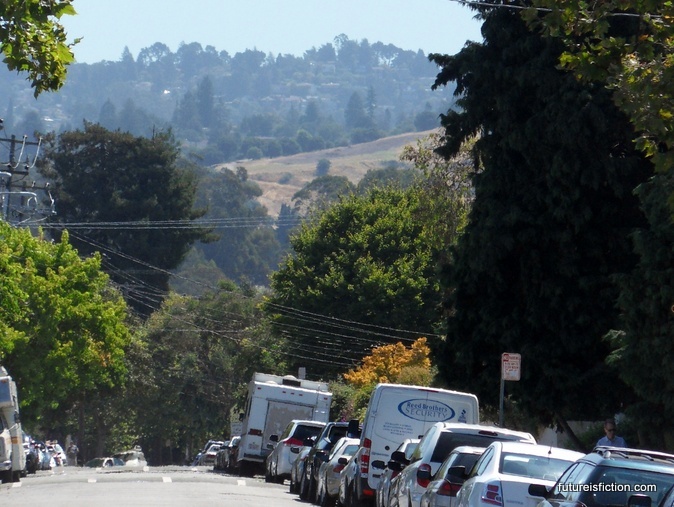 A short walk in Oakland will reveal attention to beauty. When I reach the post office, there’s a small shady bench surrounded by mosaics tucked away behind an otherwise generic shopping plaza. On the way back I pass the huge building that the owner allowed muralists to cover. There’s graffiti and sticker art everywhere. All of these things were created by fellow humans, expressing themselves. The city itself is speaking to me, through the voice of its art, from the writing in the sidewalk to the architecture. My desire to capture the random awesome of an Oakland walk started with this truck. 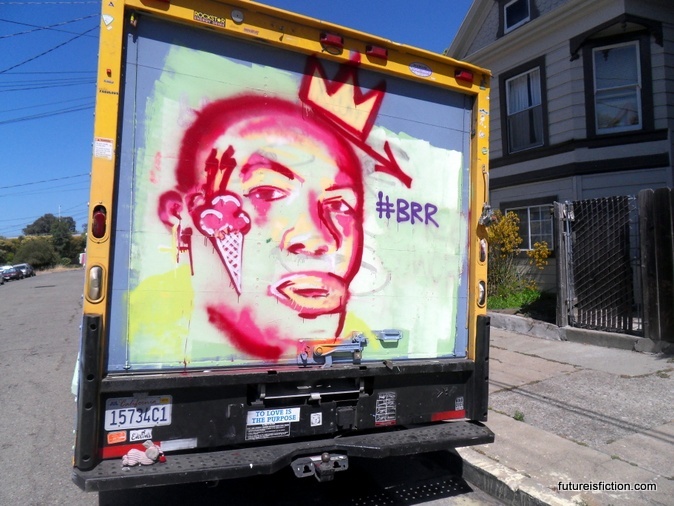 The art on the truck isn’t outstanding compared to some of the paint you see in Oakland, but I was intrigued by the random WTFness of the artist’s placement of the ice cream cone. The art on the truck is not the only random thing in this picture. Though I like the quick and dirty nature of this graffiti (in style, it reminds me a bit of Josh Petker), there’s tons of great street art in Oakland so normally it wouldn’t make the cut of stuff I’d blog about. But there’s something else going on in this moment, and it’s that for no explainable reason there’s a toy rabbit chilling on the ledge of the truck. The next thing I spot that’s photo-worthy is this art car. By far not the most elaborate art car I’ve seen around here, but really a car that’s been used as a canvas is a rare enough thing in the rest of the US that any art car is worth noting. The hood of the car had a painting of Munsch’s The Scream (sorry bad photo doesn’t do it justice…too much sunshine). But here’s the thing. You might think this random bit of awesome was several blocks from the previous one…but in fact that truck you can see in the second picture is the same one with the beanie baby and the ice cream king. And when I look up in the distance, I get the Oakland hills. Any given glance North or East will give you a view like this. Again, this isn’t a breathtaking view that you would download and set as the background on your desktop. But it is quite nice. So this is one sweeping moment in Oakland: two very different kinds of street art and lush vistas in the distance. Here are some of the houses I passed on my walk, which Map My Walk tells me was .88 miles. With the fancy houses and artsy cars and hella hills and beanie babies, life is feeling good. Like Alice in Wonderland, Oakland is a Fairyland of whimsy. Curious and curiouser… But what’s this? While standing across the street from the second house, I realize someone has left a note wedged to a telephone pole. Remember how exciting it was in grade school to get the opportunity to read a note someone meant to pass along to another classmate? This is like that. It’s exactly how the protagonist of To Kill A Mockingbird would hide notes in the hollow of a tree, if Scout Finch were older and maybe a homeless junkie. Of course I read it. Most of it contained professions of love, written in handwriting I’d associate with a thirteen year-old girl. The rest of the note indicates that she is going to purchase some entertainment for the evening, and has already acquired an evening coat appropriate to the occasion. Ah the rumblings of sweet love. How she woos! “Bought you a jacket already! I’m still going to buy some speed!” To be fair, the rest of the note was very romantic. OK, I admit that maybe this note is an example of the kind of thing that drives the baby-mamas to live in Berkeley and shout “NIMBY!” And true, this isn’t thought of as a “good” neighborhood. I think of the miles upon miles of boring, good neighborhoods in the monoculture where I grew up, and tiny bits of beauty like this were few and far between. It’s worth mentioning that even when Oakland is filthy, on the same streets with the soiled condoms and the broken glass, there is so much culture and beauty.